Established this year, Crafty Kestrel is run by the lovely Kerry. Based in Warwickshire Kerry has also authored two books, A Year in Woolly Wonders and A Woollyful Christmas. She has turned her hobby into her business and has set up an online shop to sell her creations. 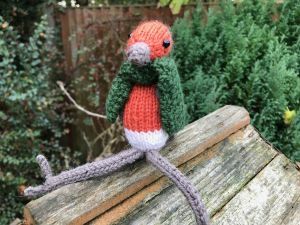 Kerry was kind enough to send me this beautiful knitted robin to review for my 2018 Christmas gift guide. Noel the Robin is extremely well made and very cute. A perfect seasonal gift, Noel is not a toy, and is not suitable for children under the age of 14. That aside I think it would look lovely as a decoration around the house, perhaps perched on a shelf or mantlepiece. Noel would also be a wonderful addition to a Christmas tree, snuggled into tinsel or peeping out between baubles. 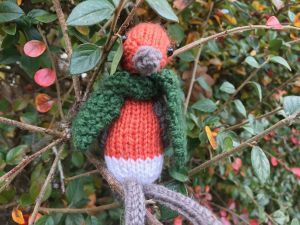 Noel the Robin is approximately 19 centimetres in length and made from 100% wool with black bead eyes. He is part of Kerry’s woodland creatures range where his friends include George the Mouse. Other knitted creations are Flo the Fairy (I think she’d look beautiful at the top of the tree), Pablo the Penguin and Rodney the Reindeer amongst others including Nick Claus himself! Kerry also makes felted creatures, and sells patterns, cushions, wash cloths, wrapping paper and pictures. Shipping is worldwide and each one is lovingly handmade to order. I think that these creations would be wonderful gifts at Christmas or during the year. The books would be ideal presents for anyone creative in your life too. 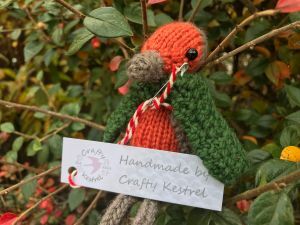 For more information about Kerry or Crafty Kestrel, or to place an order, do check out her website here. N.B. I was gifted Noel the Robin in exchange for him being featured on my Christmas Gift Guide 2018. All thoughts are my own. For further information please see my disclosure page.